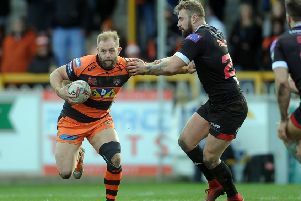 Castleford Tigers threw away a 16-point lead with 15 minutes to play as they suffered a home defeat to local rivals Wakefield Wildcats in front of a massive crowd at the Mend-A-Hose Jungle. Daryl Powell’s men looked set to carry on where they left off last season as they appeared in control at 22-6, but three unanswered tries saw the game turned on its head by the Wildcats, who ran out 24-22 winners. Castleford included five of their close season signings, but there was no place for overseas recruit Ben Roberts with Luke Gale and Liam Finn given first chance to establish a new half-back partnership. It was Wakefield who had the first chance after an early forward pass by the hosts gave them good field position, but Danny Washbrook dropped Jacob Miller’s pass five metres from the line. Cas suffered an early blow with centre Ashley Gibson limping off, to be replaced by Jake Webster, but they were first to score on 10 minutes when new half-back Luke Gale found Jordan Tansey and his fine long pass out wide sent Denny Solomona over for a try in the corner on his competitive debut for the Tigers. A second try followed five minutes later as another new boy, Junior Moors, made a half-break and offloaded to Webster, who then flicked a pass out to Solomona. There was a lot of work for the winger to do as he collected the ball on the half-volley and did not lose any momentum on a pacy run to score in the corner again. Gale converted from the touchline to make it 10-0. Back came Wakefield and Paul McShane came up with an individual bit of magic to dummy from acting half before racing over for a try converted by Craig Hall. They had another chance soon after, but a forward pass near the line ended their opportunity. After defending well for a spell Cas attacked again and came up with their third try when Gale sent a dummy out and raced through a gap bear the line for a try he converted. It stayed 16-6 to half-time with the Wildcats bombing a great chance just before the break, Ali Lauitiiti losing the ball over the line in attempting to reach out. Castleford exerted strong pressure at the start of the second half as Gale’s low grubber kick was just hacked away to safety behind his own line by Hall then Gale and Michael Shenton were both held up over the line. It was Wakefield’s turn to go close when their former Cas man Richard Owen dropped the ball under pressure from Shenton in attempting to dive over in the corner. But the hosts were soon on top again with Justin Carney held up over the line and Steve Crossley similarly stopped seconds after. Finn’s dangerous kick was just cleared with Shenton and Carney set to pounce and somehow the Wildcats held on again. However, the pressure did finally tell when Carney juggled Finn’s long pass into the corner to dive over a try that was superbly converted by Gale from the touchline. It was somewhat out of the blue when Wakefield replied with a try on 65 minutes as Pita Godinet got to Tim Smith’s kick through and grounded the ball over the line. With Hall goaling it was suddenly game on and Cas declined to take a chance to kill it again when they did not go for goal from a penalty. They were to rue that decision as the Wildcats scored again when Ali Lauitiiti forced his way over after taking Hall’s offload. Another goal from Hall and there was now only four points in it with seven minutes still remaining. Only last ditch defending by Solomona prevented another Wakefield try from the next set and suddenly the Tigers were falling apart. Wakefield’s hopes turned into unconfined joy three minutes from time when Smith’s clever pass sent Washbrook galloping over for what would prove the winning try. Hall converted from under the posts to put his side in front for the first time. Cas huffed and puffed in the last minute, but it was all over for them when Finn’s grubber kick was kept out near the line. Scorers - Castleford: Tries Solomona 2, Gale, Carney; goals Gale 3. Wakefield: Tries McShane, Godinet, Lauitiiti, Washbrook; goals Hall 4. Castleford: Tansey; Solomona, Gibson, Shenton, Carney; Gale, Finn; Lynch, Moore, Millington, Holmes, Moors, Massey. Subs: Milner, Crossley, Boyle, Webster. Wakefield: Hall; Riley, Collis, Lyne, Owen; Miller, Smith; Scruton, McShane, Paea, Kirmond, Washbrook, Smith. Subs: Godinet, Anderson, Annakin, Lauitiiti.